After 6 years of absence of Siberian pine nuts now we have the opportunity to export pine nuts from Russia! We are renting a parcel of Siberian taiga forest and received a license for exporting pine nuts from Russia. Gathering and processing of pine nuts is be done together with the residents of kin's settlement in Tomsk city. A team of brave people working together with North American Siberian Pine Nut Oil company organizes expeditions to the taiga, and delivers to your table wholesome and fresh pine nuts within a period of two weeks after the nuts have been shelled. 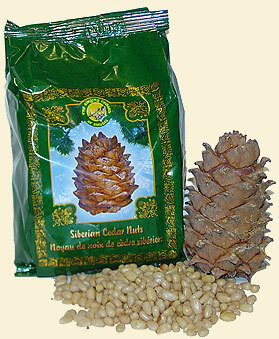 Siberian pine nuts are completely organic and wild harvested. 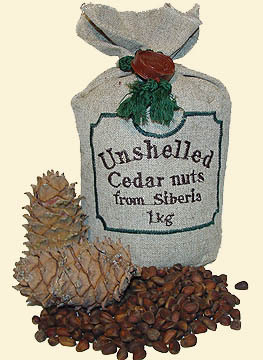 Siberian pine nuts are the most valuable product of all known products obtained from various plants. On average, any product - whether nuts, fruits, seeds, root vegetables, or berries - takes from three to five months to ripen, and ripening does not occur during the winter. Pine nuts ripen over a period of two years, and are a much more valuable product for human health. Pine nuts have long been used in various cuisines of the world; they are held in high regard for their unique taste and medicinal properties. With an amazing slightly sweet taste containing hints of milk, pine nuts have been used both in basic dishes and desserts. The nuts have always been a delicacy and a much sought-after ingredient at the tables of nobles and kings. 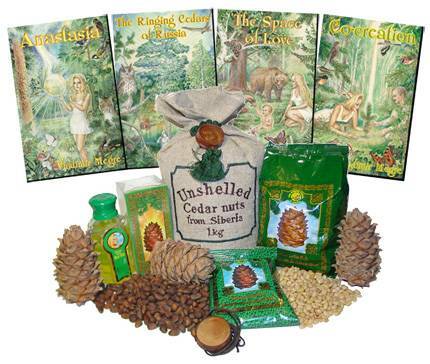 Modern science has studied the chemical composition of pine nuts and explained their usefulness. Popular scientific literature also points out that the quality of pine growing in Northern areas is much higher than those in the South. Back in 1792 academician P. S. Pallas wrote that the Siberian pine nuts rejuvenate man's power. They also bring back youthfulness, stimulate the immune system considerably, increasing the physical body's resistance against many diseases. We do not wait until we have processed all the nuts, but ship out pine nuts in small batches to warehouses in America, Canada, and Germany. Our warehouses are equipped with commercial freezers, which ensure the maximum preservation of the pine nuts. Pine nuts are shipped from Russia to America, Canada, and Germany only by airline over the course of two days and only in thermally insulated containers. After you receive your pine nuts, they must be kept in a refrigerator. Siberian Pine Nut Oil company is a for-profit company, but we also want to incorporate a positive impact on society. We will contribute ten percent of our profits to global ringing pines movement and eco-settlements. As we grow, we intend to cooperate with residents of eco-settlements in Siberia to grow production of wild harvested, organic pine nuts which will create new jobs. We believe when people will have stable job in eco-settlement, it will make much easier to move to eco-settlement. Q? : What about Chinese pine nuts? I saw them in local food store. A: Pine nuts must be fresh to benefit the body. But what is going on today? Before they reach a satisfied purchaser in the United States or Canada, pine nuts pass through many middlemen over the course of 16 to 19 months. So, 19 months goes by! From the day the nuts are found in the forest to the day you buy them in a store: A year and a half! Any type of freshness is out of the question. In order to increase their profit from the processing of pine nuts, Chinese producers initially extract the oil from the nuts using a chemical means that does not destroy the structure of the nut. This is done to derive the greatest profit, because pine nut oil is worth more than 80 dollars a kilogram on the market. So, they have already made money from the oil, and they are now making money from the nuts; here is the Chinese "miracle." Obtaining the oil using extraction. The extraction method of removing oil is the most economical and ensures the maximum yield of the raw oil. Sunflower seeds, pine nuts, cotton seeds, linen seeds, peanuts and others are processed in the same way. Q? : What about Italian pine nuts? A: Italian pine nuts, off course, much better then Chinese ones, but they cannot be considered organic and wild harvested because they are grooving in artificial plantations in Italy and as any cultivated plant goes through fertilisation proses. Cedar nuts contain valuable lipolytic vitamins E and P . E-group vitamins, or tocopherols, are very important and essential in ensuring complete genetic heredity. (The word tocopherol in Greek literally means "I bear offspring”.) A deficiency of Vitamin E upsets the fatty balance in the system. Vitamin E is responsible for the production of milk in nursing mothers, and its deficiency can stop lactation. A person's predisposition to atherosclerosis can also be explained by a Vitamin-E deficiency. Cedar - here referring to the Siberian pine.